Howdy readers, Lafe here. About once a month, my partner in crime, Rich Seeley, has been doing technical takeovers of this blog. Here's his latest post, which goes over the fundamentals of implementing Scrum using Visual Studio. Even if you are new to Scrum you probably know that basically it's an agile programming methodology that can be used with Visual Studio. In keeping with the agile philosophy, Scrum is the opposite of the old step-by-step "waterfall" approach to application development where there is a lengthy product planning stage, then the programming, then the testing, and if everything works perfectly, which it almost never does, deploying. The waterfall approach, which dates back to an era where IT had huge water cooled mainframes running in air conditioned computer rooms, is not likely to work well where businesses need mobile apps for the immediate gratification of consumers who may change their minds daily if not hourly. "A key principle of Scrum is the dual recognition that customers will change their minds about what they want or need (often called requirements volatility) and that there will be unpredictable challenges—for which a predictive or planned approach is not suited," a Wikipedia article explains. Scrum breaks development down to smaller steps. The planning stage, which could take months in waterfall, is minimized to quickly come up with basic requirements. "We need an app for impulse buyers so they can view and buy our featured smart gadget quickly and easily." From there you go to the build stage where your team of developers creates an app to do that. Testing comes next and if the app passes review, you might be able to deploy it. Of course, there's likely to be requirements volatility as sales and marketing people realize the app needs to be changed. In old school development this could be a crisis. But with Scrum it just creates another step in the ongoing application development process. The Scrum team just moves on with the new requirements to another incremental stage of planning, building, testing and review, as consultant Steve Stedman, explains in a very short, animated and entertaining YouTube video Introduction to Scrum in 7 Minutes. These incremental stages are called Sprints in Scrum terminology and usually take one to three weeks, Stedman explains. Sprints are repeated until the app is "feature complete," he says. This is all part of what the Wikipedia article calls "an evidence-based empirical approach—accepting that the problem cannot be fully understood or defined up front, and instead focusing on how to maximize the team's ability to deliver quickly, to respond to emerging requirements, and to adapt to evolving technologies and changes in market conditions." For those using Visual Studio for Scrum development, Microsoft offers specifics with special focus on the team concept. Responsible for what the team is building, and why they're building it. The product owner is responsible for keeping the backlog up-to-date and in priority order. Responsible to ensure the scrum process is followed by the team. Scrum masters are continually on the lookout for how the team can improve, while also resolving impediments (blocking issues) that arise during the sprint. Scrum masters are part coach, part team member, and part cheerleader. These are the individuals that actually build the product. The team owns the engineering of the product, and the quality that goes with it. Boer also explains the unique terminology in the Scrum process beginning with "Product Backlog," which doesn't have the negative connotation of a logjam on unfinished business but is rather "a prioritized list of value the team can deliver." So it's really more of a to-do list. The Product Owner is the custodian of the Product Backlog and is responsible for prioritizing and reprioritizing items, and making additions and changes to the list of things the Scrum team is developing. There is also a Sprint Backlog where the team decides what items it will be able to complete in a given Sprint. 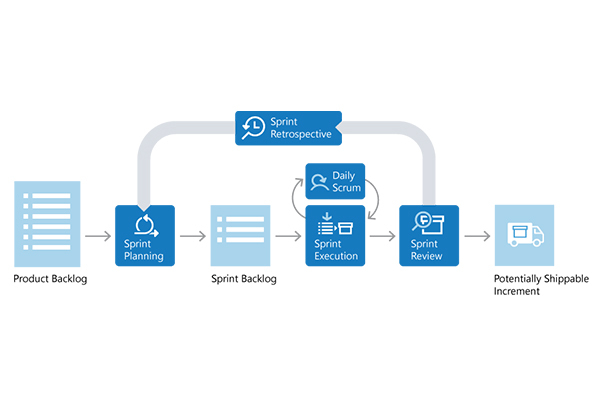 "Often, each item on the Sprint Backlog is broken down into tasks," Boer explains. "Once all members agree the Sprint Backlog is achievable, the Sprint starts." This seems a good way to avoid the common application development bugaboo: over promising and under delivering. Lists each backlog item the team is working on, broken down into the tasks required to complete it. Tasks are placed in To Do, In Progress, and Done columns based on their status. It provides a visual way of tracking progress for each backlog item. A graph that plots the daily total of remaining work. Remaining work is typically in hours. It provides a visual way of showing whether the team is "on track" to complete all the work by the end of the Sprint. At the completion of a Sprint, the team holds a Sprint Review where they meet with the Product Owner and other stakeholders to show off the product, known as an "Increment" or a "Potentially Shippable Increment" if the owner approves it. There is also a Sprint Retrospective where team members go over what went right, what went wrong and how to improve things for the next Sprint. Since the Increment may not be a final product, the Scrum Team will likely go on to do another Sprint. This is the heart of the agile process which Boer characterizes as "Repeat. Learn. Improve."